Antietam: McClellan Reacts to the "Lost Order"
McClellan Reacts to the "Lost Order"
Maryland Campaign analysts have long pondered Major General George B. McClellan's strategic reaction to the mislaid copy of Lee's Special Orders No. 191 by which Confederate plans were disclosed. Opposing interpretive camps have formed, one criticizing McClellan for cautious inaction, the other praising vigorous pursuit. These diametric viewpoints are rooted in the time the Lost Order came to McClellan's hands and the sequence by which he revealed its possession and his intentions to others in both army and government circles. The Lost Order was discovered late morning on Saturday, September 13, 1862, and had been quickly conveyed up the chain of command to McClellan's headquarters by no later than 12 o'clock noon.1 His subsequent communications that afternoon are taken to outline an apparent pattern of reaction based on the sequence of their appearance and content. I have the whole rebel force in front of me, but am confident and no time shall be lost. I have a difficult task to perform, but with God's blessing will accomplish it. I think Lee has made a gross mistake and that he will be severely punished for it. The army is in motion as rapidly as possible. I hope for a great success if the plans of the rebels remain unchanged. We have possession of Catoctin. I have all the plans of the rebels, and will catch them in their own trap if my men are equal to the emergency. I now feel that I can count on them as of old. All forces of Pennsylvania should be placed to co-operate at Chambersburg. My respects to Mrs. Lincoln. Received most enthusiastically by the ladies. Will send you trophies. All well, and with God's blessing will accomplish it. So, immediately on the heels of the order's acquisition McClellan brought his chief executive up to speed with an unmistakable note of triumph. This suggests that McClellan had speedily devised counter-strategy he believed would spell Confederate doom through Lee's having widely divided his forces. Frederick, September 13, 1862--3 p.m.
GENERAL: The following order of march of the enemy is dated September 9. (*) General McClellan desires you to ascertain whether this order of march has thus far been followed by the enemy. As the pass through the Blue Ridge may be disputed by two columns, he desires you to approach it with great caution. R. B. Marcy, Chief of Staff. Meanwhile McClellan would push his right wing and center through Frederick into the Catoctin Valley to assail the northernmost Confederate half near Boonsboro with dramatic numerical superiority. This is the only campaign document wherein McClellan specifically states his reactive design. An order from General R. E. Lee, addressed to General D. H. Hill, which has accidentally come into my hands this evening - the authenticity of which is unquestionable - discloses some of the plans of the enemy, and shows most conclusively that the main rebel army is now before us... This army marches forward early tomorrow morning, and will make forced marches... Portions of Burnside's and Franklin's corps moved forward this evening... upon the success of this army the fate of the nation depends... Unless General Lee has changed his plans, I expect a severe general engagement tomorrow. I feel confident that there is now no rebel force immediately threatening Washington or Baltimore, but that I have the mass of their troops to contend with, and they outnumber me when united. If they were sent nearly twelve hours apart, there exists odd comparison between the Lincoln and Halleck telegrams. The first to Lincoln expresses no doubts despite the Lost Order coming so recently to hand. Much later the second telegram is more reserved, more circumspect in situational analysis. This twelve-hour transmittal gap readily suggests that intervening time gave McClellan cause for second thoughts, with General McClellan this traditionally equated with trepidation and caution. It also seems strange that McClellan would notify the President so soon after the order's acquisition without first notifying Halleck, thereby ignoring chain of command. So the question persists: was the Lincoln telegram actually sent at noon? Did the General Commanding have in mind a fully formed counter-strategy by noon on September 13th? Probably not. Often cited, the time of writing of that telegram is recorded in the Official Records as "12 M", this is interpreted as "meridian" or noon. The War Department officer tasked with compilation and publication of the ORs, Lt. Col. Robert N. Scott, in fact abbreviated this time signature. 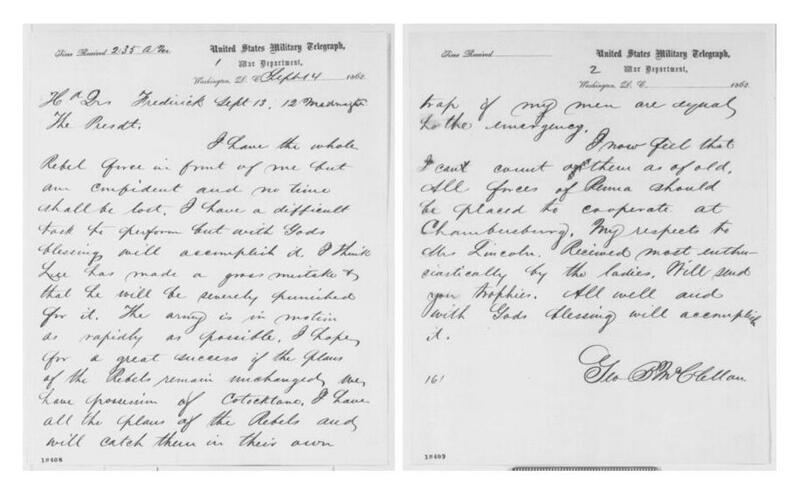 The original telegram, held in the Lincoln Papers, Library of Congress, bears the full time signature - "12 midnight" - completely altering the sequence and sense of McClellan's disclosure. After proper displacement of the telegram from the beginning to the end of sequence, the correct sequence of communications then begins with McClellan's interrogatory note to Pleasonton at 3 that afternoon, followed by far more explicit discourse to Franklin at 6:20. This dramatically redefines the elapsed time within which McClellan devised counter-strategy, sent orders to carry it out, and the onset of his sense of satisfaction, even elation, at his own responsive judgment. One would naturally expect McClellan to assume this more reserved tone with Halleck in revealing his windfall. An hour later McClellan was clearly animated in characterizing to Lincoln anticipated results next day. If McClellan did not instantly resort to jubilation so soon after receiving the order, his mandate to Franklin that evening would then appear the likely catalyst to it later that night. McClellan never spoke of this being actual cause and effect. Gibbon merely stated the time of this exchange as "evening". This however roughly coincides with McClellan's lengthy instructions to Franklin. Whether the 6:20 dispatch was penned before or after his outburst to Gibbon, the expression "pitch into his center" unmistakably matches Franklin's partitioning role. Five hours later McClellan telegraphed Halleck with confidence, an hour thereafter to Lincoln in euphoria without revealing conceptual specifics he would divulge only to Franklin. The midnight telegram to Lincoln reveals that McClellan took considerable time in analyzing the Lost Order, in devising a counter-stroke, and in convincing himself and Franklin that it would work. McClellan critics therefore seem justified in arguing that he took too long to react, but in counterpoint McClellan may be praised for skillfully devising a strategically sound plan, crafted to negate his perceived numerical inferiority when confronting a united Confederate army. By day's end McClellan's midnight telegram to Lincoln clearly rejoiced in a convincingly foolproof plan made just hours before, not half a day. Ultimately McClellan's two-pronged venture on Sunday the 14th failed, not because the plan was inherently unsound, but because his right prong was held back by deadlock in the battle of South Mountain. Meanwhile Franklin's isolating left prong failed to capitalize on breakthrough at Crampton's Gap to interpose between the halves, thereby allowing Lee and Longstreet to hastily reunite with Jackson at Sharpsburg where the final showdown would occur. The midnight telegram underscores spectacular conceptual thinking born of revelation, offset the next day by the reality of actual performance on the ground. The McClellan portrait above is from an 1862 Carte de Visite in the collection of Bob Sandow at his fine gallery.